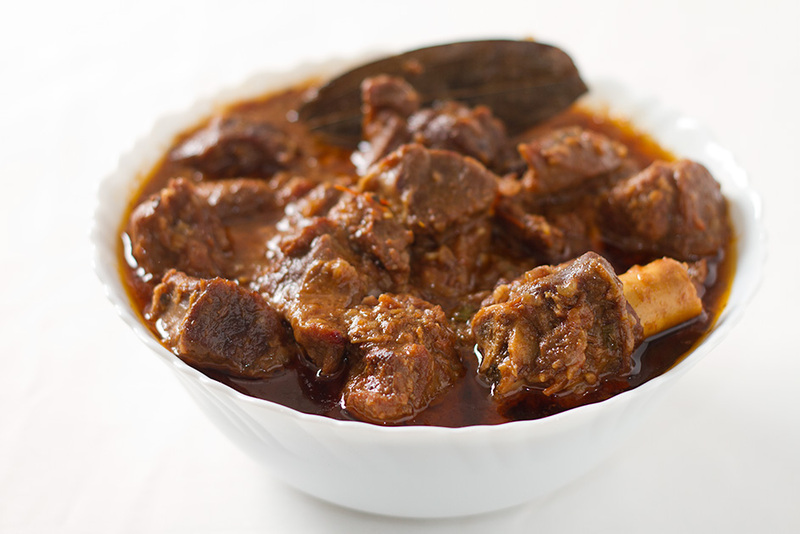 Adraki Gosht is a spicy and tasty gravy of mutton with a dominant ginger flavour. Ginger is used almost all mutton preparations but this dish also uses sonth, or dried ginger powder along with fresh ginger. This recipe is very simple. The key to flavour lies in roasting the mutton in fat and/or oil along with the spices. This process called as bhun-na in Indian cooking and allows the spices to impregnate the tender meat. It does makes the cooking process a little time consuming but I think it is well worth the effort. You have to be careful in not letting the masalas stick to the bottom of the pan while bhunoing (can that that be a word? 😉 ) by often stirring and scraping, along with sprinkling water. Dry roast Coriander seeds, and run it through the coffee grinder. You can use ready made coriander powder too. Crush green cardamoms, black cardamom, cumin seeds, cinnamon, clove, mace in a mortar and pestle. Crush it just enough for the spices to release their flavours. Heat ghee in a pressure pan add bay leaf and crushed khada masala. Fry for a few seconds and add onions. Saute till they are translucent and, add mutton followed by ginger and garlic. Reduce the flame. Fry on medium heat till mutton is well browned and add coriander powder and dry ginger powder along with red chile powder. Fry for a few seconds and add tomatoes. Add salt. Keep stirring and cooking for about 20 minutes till the tomatoes are well mixed with masala and mutton and ghee starts to surface. This is the most important step of this dish. You need to bhuno the mutton in masalas. Keep sprinkling water if the masalas start to stick to the bottom of the pan. Add about a glass of warm water to the pressure pan and close the lid. After one whistle, cook for about 20 minutes (that should be enough for the mutton to tender. Open the pressure pan only after the pressure drops. Serve this tasty Mutton curry with roti or nan. Ginger (Zingiber officinale Roscoe) is a flowering plant in the family Zingiberaceae whose rhizome, ginger root or simply ginger, is widely used as a spice or a medicine. It is a herbaceous perennial which grows annual stems about a meter tall bearing narrow green leaves and yellow flowers. Ginger is indigenous to southern China, and was spread eventually to the Spice Islands, other parts of Asia and subsequently to West Africa and the Caribbean. Ginger was exported to Europe via India in the first century AD as a result of the lucrative spice trade. India is now the largest producer of ginger. The origin of “ginger” is from the mid-14th century, from Old English gingifer, from Medieval Latin gingiber, from Latin zingiberi, from Greek zingiberis, from Prakrit (Middle Indic) singabera, from Sanskrit srngaveram, from srngam “horn” + vera- “body”, from the shape of its root. Ginger produces a hot, fragrant kitchen spice. Fresh ginger can be substituted for ground ginger (sonth) at a ratio of six to one, although the flavors of fresh and dried ginger are somewhat different. Powdered dry ginger root is typically used as a flavoring for recipes such as gingerbread, cookies, crackers and cakes, ginger ale, and ginger beer. You have a great blog with some great recipes and awesome photography. I am reaching out to you from http://www.itspotluck.com a social platform for Indian/Desi food lovers. It is a community of hundreds of food bloggers with thousands of recipes and counting. You might find some fellow bloggers from India and abroad as well on our platform. The current services are just a beginning and we will be adding additional functionalities that will truly make this a global platform for Indian food. We hope you like what we are presenting and would join our growing community of Indian food lovers. Don’t wait – join today. Our facebook page https://www.facebook.com/its.Potluck is frequently updated with food related news and exciting recipes so stay connected via facebook as well. Thank you and looking forward to having you as part of itsPotluck community. Please ignore this email if you are already a member.